Study the entire Book of Revelation starting with John's theology that teaches that Jesus, the exalted Christ, is the center of faith. Some of the major ideas explored are: personal religious experience; the living voice of God in the church today; advocating for what is right; distinguishing between good and evil; God's grace seeks to redeem; and covenant with God.More than 3.5 million copies of the series have been sold.This revision of the Abingdon classic Genesis to Revelation Series is a comprehensive, verse-by-verse, book-by-book study of the Bible based on the NIV. These studies help readers strengthen their understanding and appreciation of the Bible by enabling them to engage the Scripture on three levels: What does the Bible say? Questions to consider while reading the passage for each session.What does the passage mean? Unpacks key verses in the selected passage.How does the Scripture relate to my life? Provides three major ideas that have meaning for our lives today. The meaning of the selected passages are made clear by considering such aspects as ancient customs, locations of places, and the meanings of words. The simple format makes the study easy to use. Updates will include: New cover designs.New interior designs.Leader Guide per matching Participant Book (rather than multiple volumes in one book).Updated to 2011 revision of the New International Version Translation (NIV).Updated references to New Interpreters Dictionary of the Bible.Include biblical chapters on the contents page beside session lesson titles for at-a-glance overview of biblical structure. The simple format makes the study easy to use. Each volume is 13 sessions and has a separate leader guide. 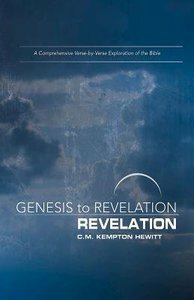 About "Revelation : A Comprehensive Verse-By-Verse Exploration of the Bible (Participant Book) (Genesis To Revelation Series)"